Daniel P. Wilson is an actor, director, producer, and arts management professional, as well as a seventh generation native of San Jose, CA. Dan recently joined Triangle ArtWorks as its ArtSwell Program Manager (and first official hire), where he will be working with a number of regional partner organizations to build and launch an ongoing, year-round, professional development program for the arts. Prior to relocating (with his wife and three small children) to the Raleigh/Triangle area of North Carolina, he proudly served for four years as the Associate Artistic Director of Los Altos Stage Company, helping to produce 22 productions during his tenure there. Dan is a graduate of the Pacific Conservatory of the Performing Arts and holds a BFA in Directing from Roosevelt University in Chicago. 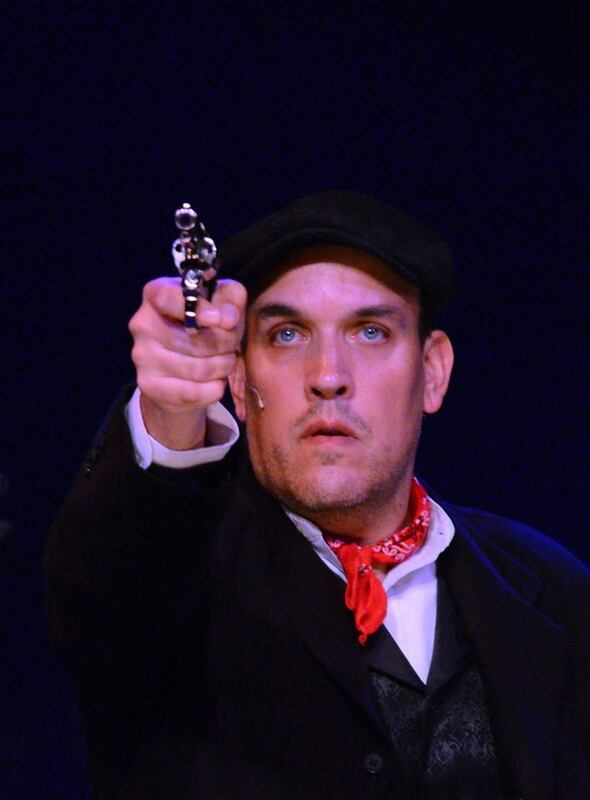 Dan Wilson as Leon Czolgosz in Assassins. As a performer Dan has appeared in more than 50 stage productions, and acted in a dozen commercials and a handful of television and film projects. Favorite roles have included Don Quixote in Man of La Mancha, Lockstock in Urinetown, Kerchak in Tarzan, Leon Czolgosz in Assassins, and Tom Joad in Grapes of Wrath. His most recent screen credit was as the Narrator for the documentary film, Changing Boundaries: The History of San Jose. Dan most recently directed Joseph Heller's Catch-22 at Los Altos Stage Company where he had previously directed both The Fox on the Fairway, and the very successful Harold & Maude. In addition to producing 22 mainstage productions during his tenure at LASC, he also spearheaded the first two LASC co-productions with Los Altos Youth Theatre, The Wizard of Oz and Chitty Chitty Bang Bang. Other directing credits include: All Shook Up, Grease, Anthem (His own adaptation of Ayn Rand’s novella,) Thoroughly Modern Millie, Deus Ex Quanta, and 2 ½ Minute Ride. Associate/Assistant credits: The Fantasticks, Jekyll and Hyde, Cat on a Hot Tin Roof, and Play On! He has worked with the Goodman and Vitalist Theatres in Chicago, with Sweden’s Teater Magnolia, Stockholms Stadsteater, and Riksteatern, and in the SF Bay Area with Children’s Musical Theater San Jose, Peninsula Youth Theatre, and the Community School of Music & Art. In addition to his four seasons with Los Altos Stage Company, Dan worked for a number of years as Artistic Manager at Children’s Musical Theater San Jose, as a Casting Session Director for many of Hollywood’s top Commercial Casting Directors, and as a Recruiter in the corporate realm. He is a proud alum of Directors Lab West and was a long time member and Steering Committee Member of the emerging arts leaders network, genARTS Silicon Valley, from which he received the Joshua Russell Movers & Shakers Award for 2015.